Voted as “Best Pizza in Connecticut”, and earning numerous awards locally in 2010-2013, it’s safe to say Jordan’s Restaurant & Pizza is doing something right in their Norwalk kitchen. Jordan’s Restaurant & Pizza is a family owned and operated establishment that has been serving customers since 1978. That’s a lot of satisfied customers! Known for fantastic Pizzas and for being the “Best In The Catering Business,” Jordan’s also provides food service for dine-in, take-out, delivery, as well as large parties and event catering for any function or even for small family events. Specializing in Greek and Italian cuisine along with the infamous Greek style pan pizza, this place serves up plenty to leave you chatting about. The pizza sauce and dough are made fresh daily and all of the toppings are the finest freshest ingredients. We want to invite all of you to taste what many are calling the best pizza you can find. Come judge for yourself! Oh and by the way, these guys make the best homemade salad dressing in CT as far as we’re concerned. Bottled in house with secret ingredients that have been passed down from the Greek motherland…it’s serious business! Try the Kitsa Pella Salad and we promise you’ll never look at another salad the same way…ever! My second favorite pizza place in CT. Really great food and service a must try! Try the homemade bottled salad dressing to go…probably one of the best house dressings I can think of. My absolute favorite pizza, salad and steak and cheese grinder. The salad is well known and nowhere near an ordinary salad. It’s served in a bread bowl basket with awesome dressing that you can also buy. They make it in house and its really fresh. Best pizza in the area in my opinion and the grinders are very good. I judge a grinder shop by the meatballs and by the steak n cheese lol. These guys got it. The pella salad and pizza. Two best things you will try in Norwalk. The third is Bar Sugo. Try the meatballs (few types) and the figs and prosciutto, ricotta pie. After that you’re all set. Nice looking pizza! Gonna try this one out today actually. Heading to Ridgedield and it should be on my way. Local favorite for pizza. Popular salad and really good hot subs. Lots to choose from. 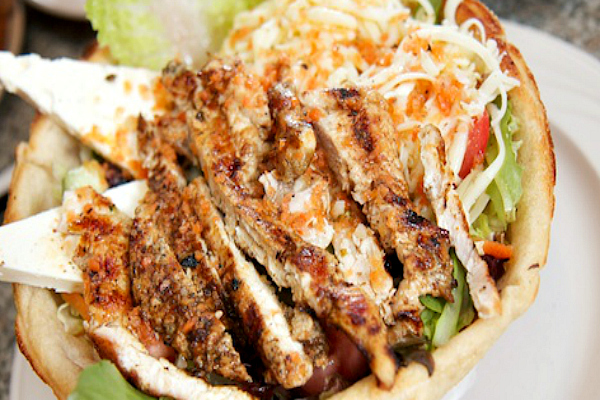 The Greek platters are all good, the gyro is popular and all the food is fresh. You can taste good ingredients and tell when a place cooks with some love. That pizza looks delicious. Following you guys on Instagram and Facebook, just realized you are the guys who did the grand opening for Tinto. Loved the video and the drunk couple dancing haha. Awesome! I’ll share the page, just don’t forget about me when you,start mailing gifts out lol. I’m serious!